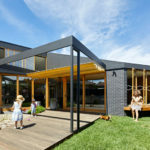 Husband and wife designers Mick and Jules Moloney of Moloney Architects have recently finished an extension to their own house in Ballarat, Australia. 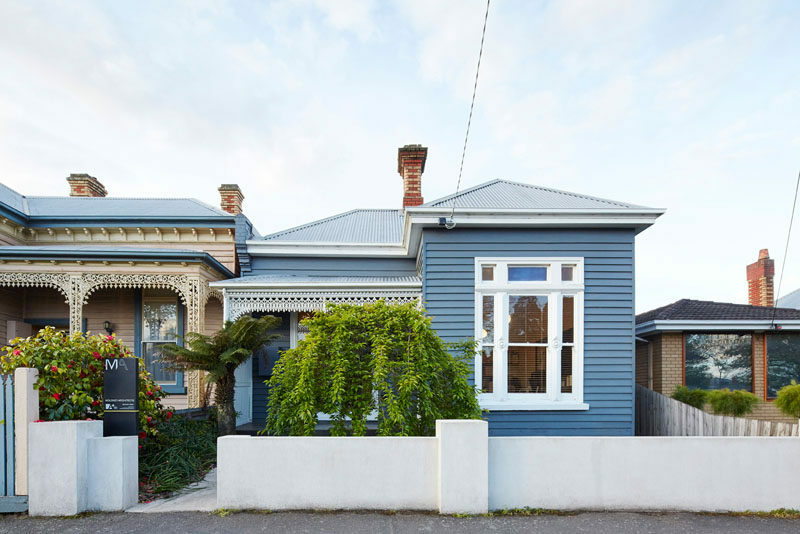 The original home is a turn-of-the-century weatherboard home, that from the front is Victorian, however the new wood extension at the rear of the home is contemporary. 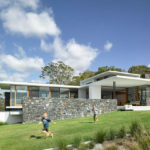 Mick and Jules wanted to renovate the main home and open it up to accommodate the changing needs of their family of five. 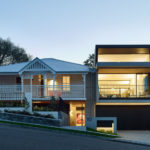 The contemporary extension continues the roof line of the house, allowing the old and the new to sit side-by-side, respecting the heritage of the original house. 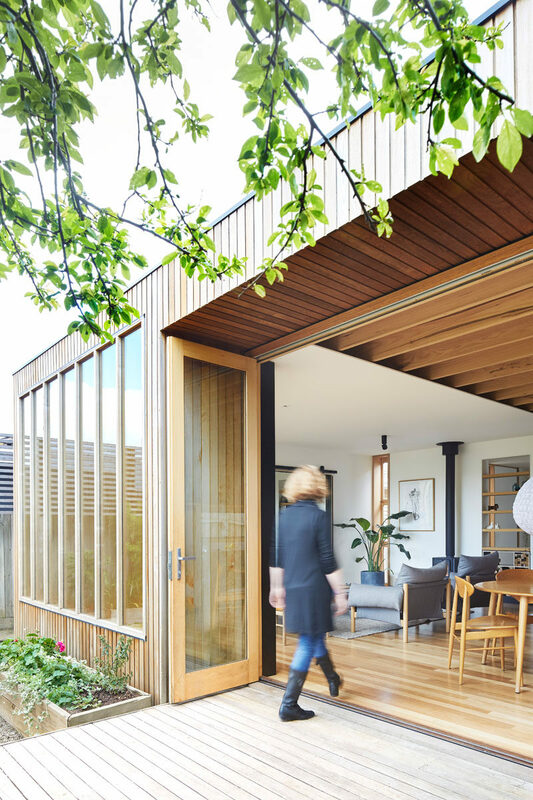 The extension is an open room with the kitchen, dining and living room all sharing the same space. White walls have been combined with wood to create a sense of warmth, and large folding doors open to the backyard. 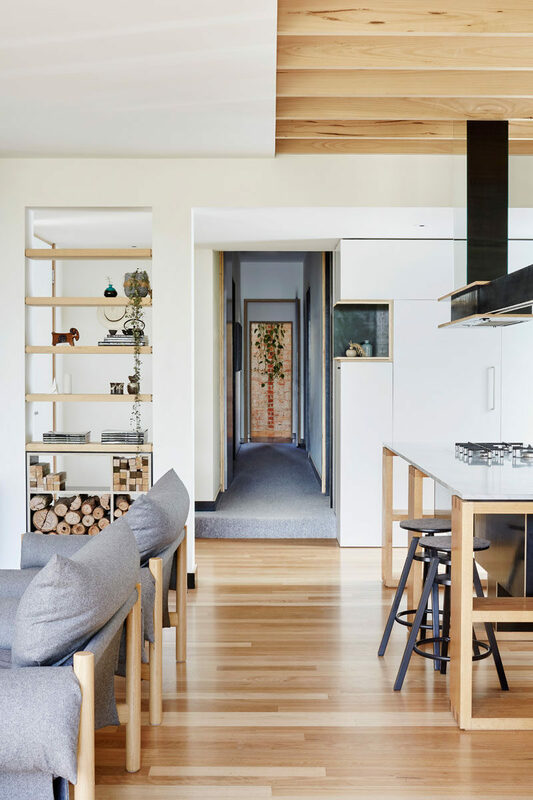 In the living room, there’s open shelving with firewood storage, and next to the shelf is a wood-burning fireplace. 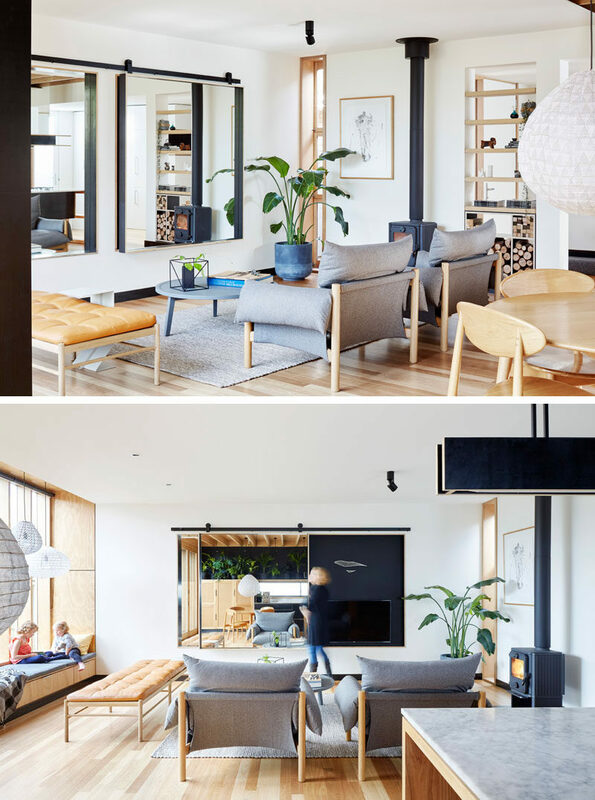 There’s also a mirror hanging on the wall, which helps to make the interior seem larger, but at the same time, also hides the television when it isn’t being used. Next to the living room is a built-in wood window seat that takes advantage of the light from the tall windows. The window seat looks out onto the backyard and has hidden storage underneath the upholstered cushion. 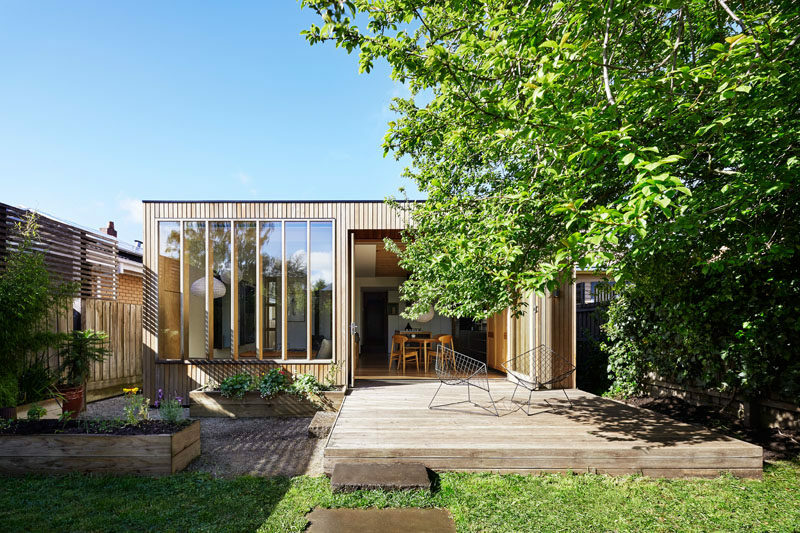 Here’s a closer look at the extension, named ‘The Wooden Box’ from the backyard. 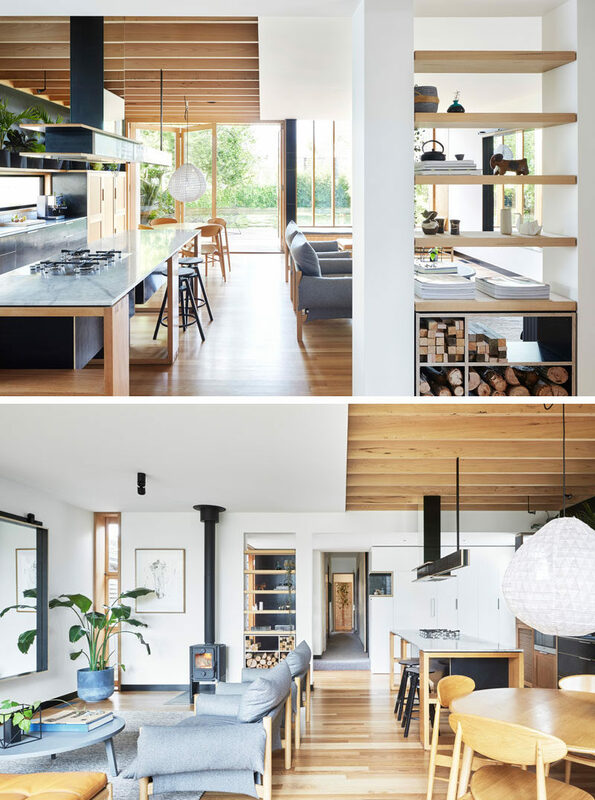 You can see where the designers got the name from as they used Tasmanian Oak for the windows and exposed beams, Cedar for the siding, and Blackbutt for the flooring. Back inside, the dining room sits next to the kitchen. The kitchen combines wood and black formply (a type of plywood) drawer fronts. A row of plants sitting above the kitchen and against the wall, add a touch of nature to the space. Here’s a look at one the bathrooms that was renovated in the home. 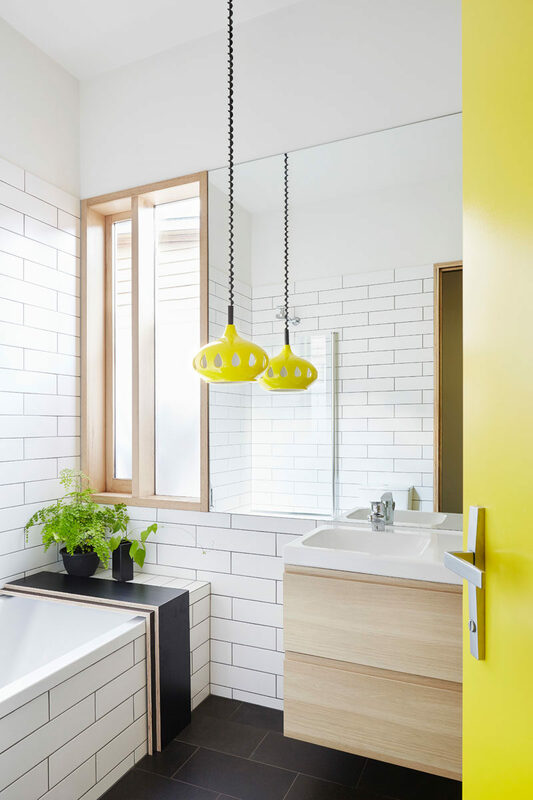 A bright yellow door matches a fun pendant light of the same color, while the remainder of the bathroom is black and white.